While there were some sprinkles here and there, this month’s autocross was the fastest one in quite a while. For those of you who read Satakal’s email “manifesto” i.e. plea for help setting up cones, you could tell that Satakal seemed to have a little more invested in this course than usual. Why? Because he took Andrew’s previous course, made some modifications and made it into his own design. How about a course that just begs for third gear? Check! A slalom that was pretty much a slalom in name only? Check! Big long sweepers? Check! A course map that looked just a bit inappropriate if you held it up the right way? Check! (Ask Kim to explain). There was no argument from any of the drivers this month. This was a freaking fun and fast course. Thanks, Satakal. No doubt, this month’s course was fast. But who made the most of it? As usual, Julien Brandt drew lots of attention with his super cool orange Catfish before the track went hot. But this month, his flashy car was flashy fast and took first place in his class. Congrats Julien! Lastly a few thoughts from us mere mortals. Having an instructor ride with me during my first set of practice laps is still really valuable. In some ways, the instructor feedback is even more valuable now compared to when I first started because I understand it in a very different way. This month, Sean Thomson was cool enough to ride along with me and share his experience. By the end of the day, my times weren’t as fast as Julien’s but they were certainly faster thanks to Sean’s coaching. I also learned what RE-71R’s feel like when they are heat cycled out (even with a fair bit of tread). They certainly didn’t help my times. Our Chapter is fortunate to have one of BMW’s premier facilities, the BMW Performance Center, located just 3 hours away. So we have organized a special program there every year since 2015, featuring a program tailored and priced just for BMW CCA members. On January 26th, over 100 members ventured into the desert to Thermal, CA, location of the Thermal Club and BMW’s Performance Center facility. To provide the maximum driving time to all members, our goal was to be very efficient. 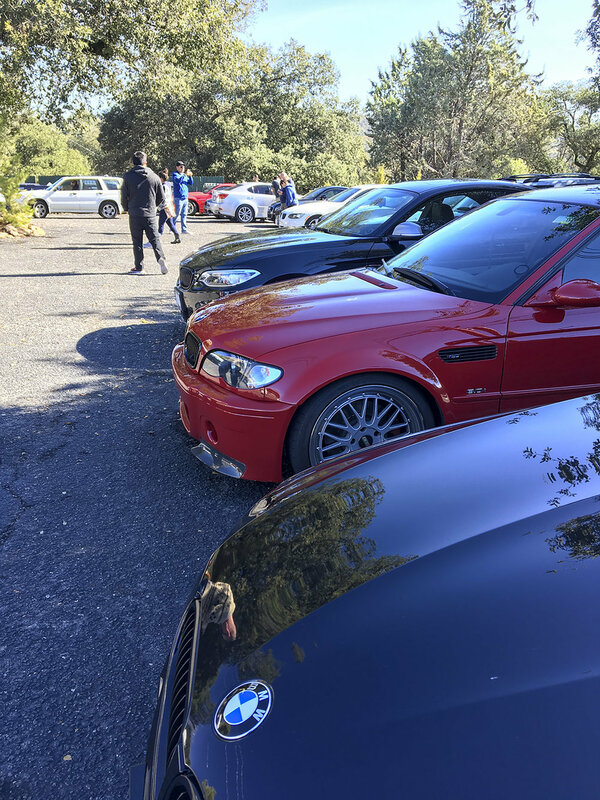 We all registered and paid online beginning last September, most participants filled out another online registration and waiver for BMW in advance, and we pre-sorted drivers into 5 equal-sized groups with a sequence of activities to follow. That got us into our buffet lunch early and led right to the driver’s meeting. The buffet lunch offered a tasty variety of salads and fruits and gourmet sandwiches, giving us a great start to our event. Our Instructor lead for the day was Brian Randall, who was very entertaining as he reviewed driving technique and briefed us on safety measures. “I named my dog Apex to make sure he would never be hit by a car.” Brian also drove us around the Hot Lap course, 3 passengers at a time, showing us how well an M3 can be drifted with careful management of extreme throttle and steering inputs. For many, riding sideways on a track was a highlight of the day. The Performance Center managed the inevitable tire destruction by having 3 more M3s parked in reserve. As Brian wasted one pair of tires, he’d just hop into the next M3! Another driving station was the Drag Race, including a U-turn at the end and a drag race back to stop precisely inside a tight box. As last year, the AWD straight-line specials included the X5M, X6M and M550i. Those heavy SUVs are uncanny in their ability to accelerate, corner and stop so quickly. You can’t break the laws of physics, but these X5s and X6s surely bend them. With full throttle and full braking runs all day long, the cars never got hot and the brakes never faded on a nearly 80 degree day. Good thermal management indeed. A surprise treat was that BMW included two of their exclusive M760i’s, with 600 hp twin turbo V12s! Never before has a sub 4-second 0-60 been so stately. Where else would you get to drag race two V12 sedans side by side? To learn how to manage momentum on a slick surface, our experience included a “Rat Race.” Using their polished concrete skidpad and a tight oval layout, two drivers would start on opposite sides, then chase each other round and round while trying to close the distance. This rewarded deft throttle and steering skills to control a drift that was just sideways enough to keep the car moving forward without being at an angle that cost momentum. “When you’re going sideways, you’re not going forward.” Last year, we used 340i sedans with traction control off, which required miniscule throttle and steering inputs to win. This year was different. BMW gave us new M5s to drive, with 600 hp and all wheel drive. Having AWD was controversial when the M5 was introduced, but in this application, it was brilliant! Instead of tip-toeing around to avoid a spin in the 340i, the AWD Sport setting enabled heroic slides with lots of power that could be easily recovered with the pull of the front tires. The M5s allowed sideways AND forward to coexist, and boy was that fun! BMW generated a lot of AWD converts that day, which is good since the next-generation M3 will have the same system. Those with a competitive streak reveled in the timed autocross event. Nimble M2s and a challenging, tight course combined to bring out the Beast Mode in all of us. Each driver got to be a passenger first, learning the layout of the turns, why “Patience Corner” earned its name, and when to apply full ABS to stop within a tight box at the end. We were required to leave DSC engaged, so there was no option for the throttle steering that many of us have used at Chapter autocrosses to point our cars tighter. Each driver had two timed runs, and when the red mist cleared, the clock told us that our third place finisher was Serhan Emre, second went to Greg Uhler, and our champion in the Autocross was Joey Cipponeri. Congratulations guys! The main draw for many at the Performance Center experience was a chance to drive on one of their 3 race tracks. Only members of the Thermal Club, credentialed journalists at manufacturers’ press events (the new 911 was being introduced while we were there), or Performance Center participants are allowed to drive at this facility. We were able to learn the most challenging layout, the Desert Palm Circuit, in a lead-follow format. Three groups of Instructors would lead 3 drivers each around on the correct “line” while in constant radio contact. It was a great way to learn how to manage straight-line braking, precise turn-in, accurately hitting the apex, progressive throttle application, and unwinding to the exit in each turn. The layout had everything from a second-gear hairpin to a 115 mph straight, and the M4 Competition coupes never missed a beat all day. To provide the maximum driving time, 2 reserve M4s were parked in the paddock to save us time when refueling was needed. When the day in Thermal was over, we had managed our driving time, the BMWs managed continuous hard use without strain, and all of us managed to have a big smile on our faces. If you missed it, we have already reserved January 25th, 2020 for our next Performance Center experience. The 2018 autocross season wrapped up with Ultimate Autocross at Qualcomm on December 15. In addition to the usual autocross format, the instructors competed against each other in the super-fast electric Smart car with William Wong pulling off the victory. It was a little more than a year ago that I attended my first autocross weekend starting with the Car Control clinic. I was a bit apprehensive about the experience as I knew almost nothing about autocross. The instructors & volunteers were knowledgable, fun, and welcoming. They made my first experience a great one. Fast forward 14 months and I’ve since attended 5 more BMW autocross days, one HPDE at Thermal with the SD BMW CCA and 10 track days, including a weekend at Laguna Seca. While I’ve clearly caught the racing bug, there is little doubt that my first experience set the tone for what I expect will be many years of being a racing enthusiast. As I drove onto the lot on Dec 15, I was struck at how comfortable I had become and how cool it was to see the folks I’ve gotten to know a bit better since I started. Even though I’ve learned a lot since last year, I still found there was plenty of instruction to be had and a lot more learning that I need to do. I also found that the BMW club still did a great job at welcoming and teaching those who were new to the game. If you’ve ever considered trying out one of the autocross days, take it from someone who was a little nervous about giving it a go. That first weekend experience is the reason my annoying little Miata is always at autocross. Maybe every month now Rob? The last Tour of the year was held on December 2 and what a beautiful day it turned out to be, both in weather and in the company we shared on the road. Drivers and passengers started gathering in the middle of the Rancho San Diego Village Parking Lot at the end of the 94 and Campo Road at around 8:30am. When I arrived to set up the sign-in table, there was only a bright blue F10 M5 Sharknado and a beautiful red 1962 Triumph TR3B with the top down. By the time the driver’s briefing began at 9:15am, there were about 70 people. This was definitely shaping up to be a good day. After a chat about the event to come and road safety, respectful driving, we headed east on 94/Campo through Indian Springs and Lyons Valley Rd which had its share of ascending and descending hills and some 2nd gear turns. We eventually passed under the 8 on the 79 and onto Old Highway 80. This led us to a left onto an old favorite: Sunrise Highway. As expected for any roads in higher altitudes around Mt. Laguna in December, a white dusting had occurred sometime earlier and evidence of this was not only along the side of the road, but also some slush directly in the road not in direct sunlight. I even heard my BMW chime warning of the icy conditions outside. Does the top in that Triumph go up? Our group’s mixture of aftermarket and M Performance exhausts rumbled through the strip on Main Street Julian, turning more than a few heads. Fortunately, we weren’t stopping for lunch along Main Street as parking a hoard of auto enthusiasts would have been quite a challenge. We were still ten minutes away from our destination and those ten minutes were spent on a windy Wynola Rd before ending at Jeremy's on the Hill which served an excellent farm-to-table menu: thanks to Theresa and her excellent staff for accommodating our large group and began seating us even before they officially opened that morning. Thank you to everyone who joined us on this amazing Holiday Tour. It was great to see everyone have such a great time as well as practicing safe and controlled driving through the 74 miles of wonderful county roads. I look forward to another great turnout on our first Tour of 2019: Sunday, March 3. Hope to see you there!